Like most right thinking people, I prefer my burgers grilled outdoors over charcoal. However, that is not always possible. I've tried a bunch of different ways of cooking a burger indoors, and the usual result is a less than satisfactory burger and/or the smoke alarm going off, because the vent over my stove is mostly useless. However, I finally stumbled into a method that results in a tasty, juicy burger without a big mess and without setting off the smoke alarm. Preheat oven to 450F with cast iron griddle, ridged side up. Once preheated, cook burgers on ridged side of griddle. 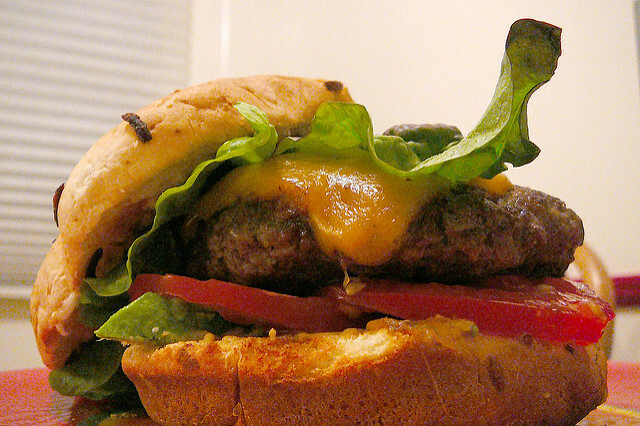 Cook 10 minutes, flip, then cook to finish which may vary depending on the thickness of the burger. It's 15 minutes total for my hand patted 1/3 lb. burgers. I'm mostly publishing this so I don't forget.